Crete is the largest island of Greece and the fiftCrete Islandh largest island in the Mediterranean. A mountainous island, it lies south of the Aegean Sea, a link between Europe, Africa and Asia. This geographical position, being at the junction of major civilizations and cultural currents, influenced its history throughout the past 5000 years. Crete has an elongated shape, 260 km long from east to west and between 15 and 60 km wide. The coastline is over 1000 km long and consists of both sandy beaches and rocky shores. The high mountains are a characteristic of the Cretan landscape.They form three mountain complexes, each with its own? Personality? Between the ranges lie semi-mountainous zones which cover the greater part of the island. There are also a few low lying plains as well as a number of high plateaus. Crete has about 600.000 inhabitants, of which over a third live in the towns of Heraklion, Hania and Rethymnon. The rest of the island is sparsely populated, with large tracts of mountainous areas frequented only by shepherds. 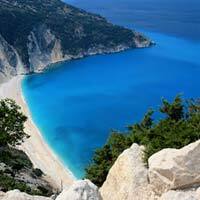 Crete has become a very popular holiday destination for northern Europeans. The current number of visitors per year is around 3 million. Most of them arrive by charter to Heraklion or Hania airport. Traveling eastwards you can visit the anciend ruins of the town Gournia, the most southernΒ town in Europe, Ierapetra andΒ Agios Nikolaos Β with it's pretty harbour and seafront cafeterias. A visit to the monastery of Toplou is on the way just before arriving at Vai beach with it's crystal clear waters and palm fringed beach. Everyone should visit the Minoan Palace of Knossos. It was excavated and reconstructed by Sir Arthur Evans. It was a political, religious and economical center while the rest of Europe was still uncivilized. The Palace was an intricate,multi-storeyed structure and it's labyrinh is said to be where Thesaus slew the Minotaur. If you decide to travel high up into the Cretan mountains you'll pass Kera Monastery and the Gateway to the Plateau on your way. pectacular scenery awaits you traveling through traditinal Cretan villages brings us to the Dikti Gave and Zeu's birth place.